The program is simple; a Green LED lights up if the door is closed and a message is outputted to the console screen and the system emails you a simple message to inform you that the door is closed. 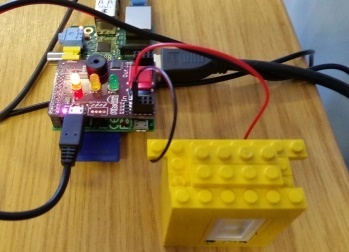 Open the door, force it open, break it down and PiBrella kicks into action. The Red LED flashes to warn of the danger! The ‘ear piercing buzzer’ provides an audio warning and again you are emailed to inform you that the door is open and someone / thing is going out or coming in! The final part of the code requires you to create a variable, called message and identify the sender and receiver of the email by their email addresses. A function called send_an_email_closed() was created to hold the code for the email which could send an email if triggered in the IF / ELIF statement and I also included the current time that the door was opened / closed with the code time_of_event = time.asctime(time.localtime(time.time())). Then just film, add some titles and some tense theme music!